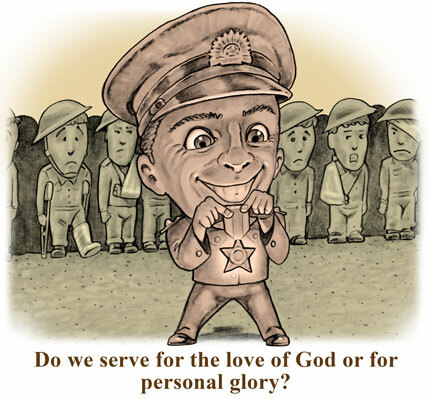 Free Christian military illustrations that can be used in sermons and religious education – without charge or obligation. War occurs when two or more nations are at odds and neither party will compromise. Generally, no nation is inclined to give in while it is strong and has high morale. Only when war has taken its toll and one side cannot see any hope of victory will it consider surrender. One of the hardest things about Christian living is to accept God’s plan instead of our own. Until we do, we are at war with God, which won’t be resolved until someone surrenders. We Christians can be stubborn, but we must remember that God is immutable. He can never change. He doesn’t need to – He is perfect and we are not! Even so, we often still feel we know what is best for ourselves and expect God to compromise His plans and bless ours. But God will never compromise His perfect position – we must compromise ours. Soldiers on the ground can call air-support in times of need. To do this, they simply get on their radio, make their request and give the coordinates. If everything checks out at Head Quarters (HQ), supplies will soon be parachuted in and bombs dropped to remove obstacles. 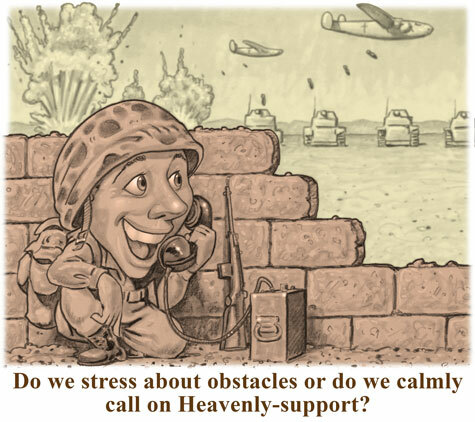 Christian soldiers on earth can call for heavenly support in times of need. We simply get on our radio (prayer), make our request and give the coordinates (petition and intercession). If everything checks out at HQ (God in Heaven sanctions the request) provision will soon be provided and obstacles removed. We must have faith our prayers are heard and do get answered. The answers are seldom in the manner and timing we desire, but when we truly trust that God knows best, even if we receive a ‘no’ to our prayer request, we are assured that God is working all things for good (Romans 8:28). If we are steadfast, even when it seems we lose battle after battle, we can be confident the war will be won and God will be glorified through our life. When you enlist in the military, you are a soldier in name only. Only after undergoing basic training in military skills and learning obedience to authority will you know how to function as part of a unit. Then you are truly called a soldier. When you believe Christ died on your behalf for your sins, you become (in-Christ) a Christian soldier. At that moment you are usually not aware you have just enlisted in God’s Army – a career that is eternal and not optional. 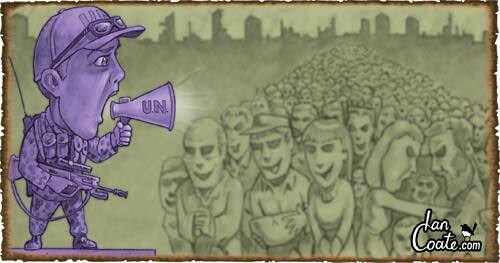 Conscription in many nations is mandatory for all able- bodied persons. New Christians, regardless of ‘physical’ circumstances, are all able ‘spiritual’ bodies. And, as in the military, enlistment is just the beginning. To overcome life’s many adversities Christian soldiers must be trained to use spiritual weapons and armour. The Bible contains our orders and instructions (a clever acronym for the BIBLE is: Basic Instructions Before Leaving Earth). 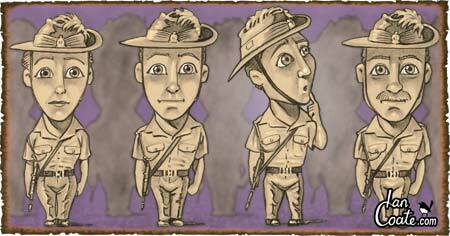 Drill Instructors are the teachers of God’s Word. They drill us in spiritual skills on how to get in step with the Christian walk and work as a team. 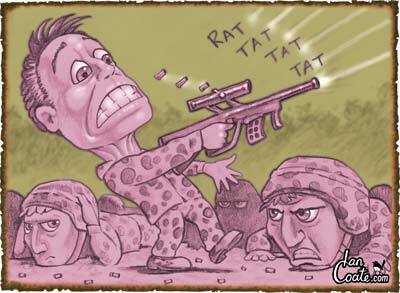 Soldiers who have fought in battles say that when bullets start flying the mind goes blank and switches to autopilot. This is where proper training is of paramount importance. Soldiers cannot be expected to be effective in battle if they have been shown something only once. They must be drilled in military skills until those skills become second nature. Then when the bullets start flying, trained soldiers will automatically respond with the appropriate action or manoeuvre without conscious thought of what should be done. There are many battles in the Christian way of life. At any moment we may suddenly find ourselves attacked for our beliefs. When the bullets start flying, if we are not prepared we will not have an appropriate answer or action to defend our faith. When suddenly put on the spot, it is common for our mind to go blank. At moments like these we are only as good as our training. If we, as Christian soldiers, are not properly prepared we will be sitting ducks to worldly-thinking that denies God and promotes self. It’s only a matter of time before we end up causalities in the spiritual-war. But if our soul is inculcated with God’s Word, we will have ready answers to defend our faith and we will respond with the right action – grace. When we are occupied with Christ, we will not react with uncertainty, anger, or self-righteous judgement. We will be imitators of our Lord: calm and graceful under fire; confident in our belief and considerate of others in theirs. When soldiers enlist in the Army, they are tested to see which service they are best suited for. The Army has four main fighting units: Infantry, Armoured, Artillery and Engineers. However, these corps would be unable to fulfil their missions without support from other corps such as Medical, Transport, Ordnance, Intelligence, Signals, and Aviation. Each corps needs soldiers to fulfil these roles, and all are necessary for proper function of the whole. Furthermore, no matter which unit they belong to, soldiers are expected to be combat-ready at all times (able to march, handle a weapon and pass a basic level of fitness). 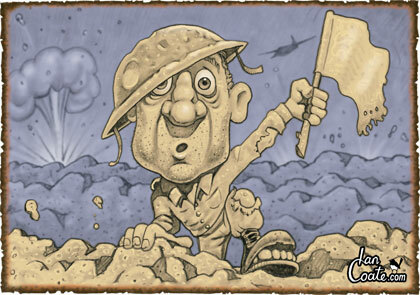 A General sent for a soldier and gave him an urgent mission: ‘Take this message to the frontline as quick as you can.’ The soldier saluted the General and ran in double-time to complete his mission. After 5 kms he came across an old man sitting exhausted by the road who yelled: ‘Hey Digger, these food packs need to get to the front and my weary bones are too tired.’ The helpful soldier loaded them in his pack and resumed his journey at a fast walk. It wasn’t long before he met a nurse aiding a wounded man. ‘Soldier,’ she called. ‘I have medical supplies that are urgently required at the frontline. Can you take them?’ He again loaded up then continued at a slower pace. 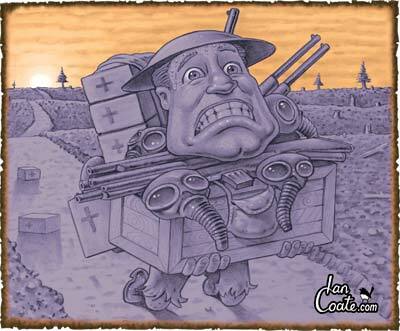 Many kilometres later the weary soldier came across a truck with a flat tyre. The driver called out: ‘Lend us a hand, Dig - these rifles and ammunition are needed immediately at the front.’ Again the tired soldier added to his load and trudged on. Just when the frontline came into view, the soldier fell to his knees and collapsed unconscious on the ground - the burden was too great. God has individually and collectively given us private missions. 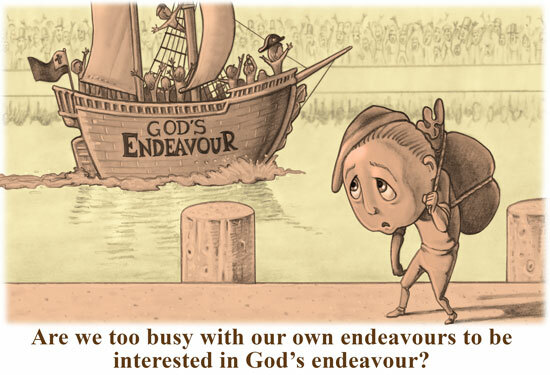 In today’s Christian climate it is easy to become overloaded with other people’s missions. One of the hardest things to do is to say ‘no’ to various worthy opportunities of service - so our personal mission can be fulfilled. A military parade is a muster of troops brought together for inspection. When onlookers witness a precise military parade where the soldiers move as one unit under the beat of single drum, they feel confident in the military’s ability to protect them – and new recruits are easy to find. 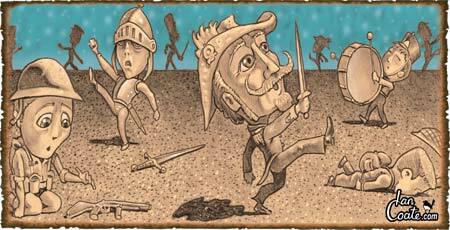 As Christian soldiers in the Army of Christ (the Church), we muster before the world each day on life’s parade ground. As the Body of Christ, we should be synchronized, have a coordinated purpose, be unified in our compassion and march gracefully in one direction - moving to the beat of the Holy Spirit’s drum. 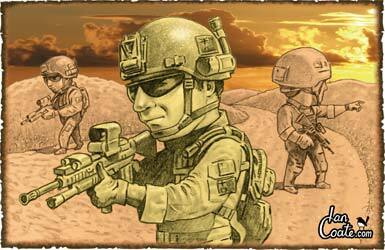 Snipers are among the most feared soldiers in warfare. They are seldom seen and can cause complete disruption to the enemy’s plans. 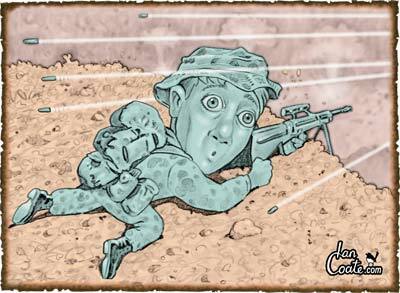 Snipers are patient soldiers who excel in marksmanship and are experts at concealment. They use long-range rifles, usually equipped with silencers, so as not to draw attention to themselves. A good sniper does not waste bullets – every shot must hit its target. 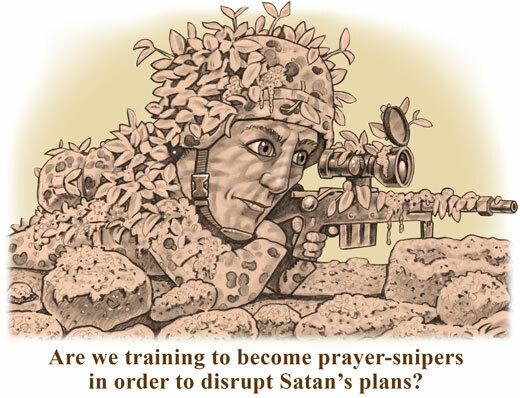 God desires His Christian soldiers to be trained up as prayer-snipers – elite spiritual warriors, whose prayers always hit the mark and cause complete disruption to the enemy’s (Satan’s) plans. We rarely know who the prayer-snipers are. These Christians are experts at concealment and bring little attention to themselves. They know the spiritual terrain and do not waste time on unnecessary prayers. They know God’s will and pray accordingly. They have the ability to focus on a prayer-target without being distracted, and their every prayer hits the mark. As Christian soldiers, we should never focus our eyes on people, (either in judging or blind devotion). We should keep eyes front, looking directly at God and discipline ourselves to not be distracted by other Christian soldiers. If we focus on what others are doing, it won’t be long before we get out of step in our spiritual life. We should simply execute our orders to the best of our ability without worrying if the soldier next to us is doing the right thing. In the ancient world, a fortress was built to give soldiers the battle’s advantage by keeping them safely out of their enemy’s reach. No soldier in their right mind would leave the safety of their fortress to fight unarmed and naked, but this is exactly what we do when we venture into the world without God. Whether we like it or not, a spiritual war is raging. God has built us an impenetrable fortress. The walls are His impregnable promises. He commands from within and offers a spiritual suit of armour for each of His Christian soldier, (Eph. 6:10-13). Yet often, when the enemy is not in sight, we don’t feel the need to remain vigilant. We ignore God’s commands, take off our armour and walk naked from the fortress in search of personal gratification – usually, straight into an ambush. The Lord is my rock and my fortress and my deliverer; My God, my strength, in whom I will trust; my shield and the horn of my salvation, my stronghold. Psalms 18:2. In warfare today, we do not use the weapons of yesteryear. 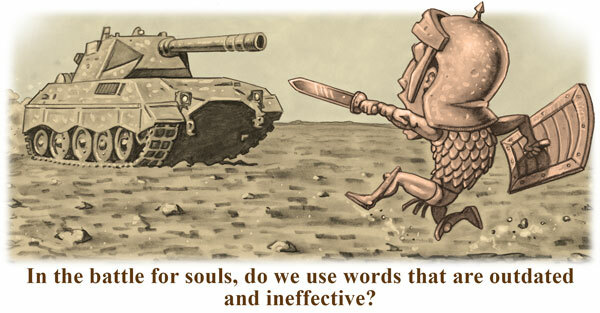 Swords, spears and bows are totally ineffective against machine guns, tanks, battle ships and aircraft. If we rush into battle armed with outdated weapons, we can expect to be quickly shot down. Today, we are in the centre of a spiritual warfare and as Christian Soldiers our orders are very clear. ‘Go out and save souls’. To achieve this we need to communicate the Gospel. And to communicate we need words – and these are our weapons. Satan is trying to make our weapons ineffective (an easy way to defeat an enemy is to disable its armaments). Many powerful spiritual words which were so effective and full of meaning in times past have been rendered useless today. Meanings change over time. In addition to this, the misuse from cults and religious nit-wits has damaged the good certain spiritual word can do. Traditionally, a naval ship’s purpose is to serve and bring glory to king and country. In order to do this, every ship needs to be manned by a captain and a crew. Each person has his own specific and individual duties that are necessary for the ship’s daily function. The ship’s success will be determined by the captain’s focus, leadership and preparedness and the crew’s training, eagerness and dedication. Ships that fail to reach their objectives are usually captained by a man seeking personal glory, or occupied by a mutinous crew. Every ship is given missions for the glory of king and country. Some will be accomplished solo and some as part of the fleet. On their return home, rewards and decorations await those ships that successfully complete their missions. A church is like a ship of the navy. Its purpose is to serve and bring glory to God in Heaven. God has commanded us to board one of His ships and become a member of the crew. We are directed to find a church that is fulfilling its spiritual missions and use our spiritual gifts to help that ship reach its objectives. The more people that are on deck ready to serve, the more God can accomplish His glorious purpose through them. Historically, you will note that Christian nations have prospered but when they turn from Him they soon go into decline. Today, the Church is diminishing in Western Nations, but rapidly expanding in nations like China and India. Captured soldiers confined in prison camps are called POWs (Prisoners of War). They undergo many terrible ordeals, trials and privations. What keeps POWs going is the thought of returning home someday. On the day they are finally freed it is a time of great celebration. When the soldiers are paraded before their liberating general, they honour him with a loud cheer and a genuine, joyous salute. We are Christian soldiers imprisoned in the Devil’s kingdom. While we live on earth we are POWs. We should expect to face various unpleasant trials and ordeals; however, we can comfort each other knowing liberation is at hand. When our Lord returns to earth, we will be freed from this worldly prison camp and pass on to our true home (Heaven). 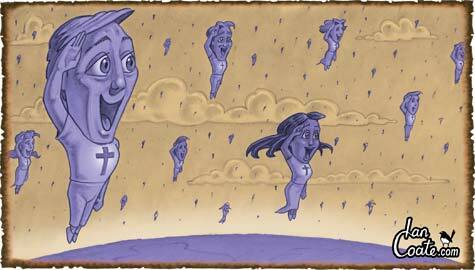 On this glorious day we will be caught up in the clouds and paraded before our liberating General - Jesus Christ. Instantly, we will be endowed with the knowledge of all He has done to set us free. Our only response will be to salute (on bended knee to worship Him). It will be the greatest salute in history - a genuine salute of respect without hypocrisy, simultaneously performed by billions of Christian soldiers in honour of our Commanding General. It will be a moment remembered for all eternity. 1 Thessalonians 4:16-18 states: For the Lord Himself will descend from heaven with a shout, with a voice of an arch-angel, and with the trumpet of God. And the dead in Christ will rise first. Why are soldiers commanded to sing? Soldiers sing for timing, to get in step, to focus many minds on a single goal, to band together in brotherhood and to fortify their courage. In times past, soldiers approached their enemy banging shields, blasting trumpets and singing loudly with complete confidence of victory. This had a psychological effect on their enemy. It is very disconcerting to see a foe with high morale, working in unity and self-assured. When an opposing army has thrown everything it has at them, it is even more unsettling to see them still standing - singing with joy and contentment. A disastrous storm brought havoc to a city, causing a great shortage of food and water. A desperate crowd gathered in the city centre. Eventually a soldier with a loud speaker stepped forward and announced that relief was on the way. He asked that an orderly queue be formed for food distribution. Suddenly there was a great stampede to the front. The slow, elderly and children were trampled. Those who stopped to help were left behind or forced to the back of the queue. Soon a great line was formed with the strongest, fastest and most cunning at the front. The weak, sick, polite and charitable were at the back. The soldier looked at the queue in disgust and then contacted his superiors on his radio. A war usually consists of many battles. These encounters often decide the outcome of the war. 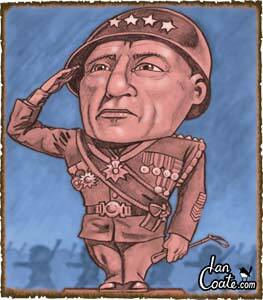 Nevertheless, a General may lose a battle but win the war – and vice versa - a General can win a battle but lose the war. As Christians, living in the devil’s world can be very discouraging. We are seeing society as a whole abandon God and Christian values. In human terms, Christianity is losing the battle. But is this something we should worry about? No; the Bible clearly states that in the end times, people will turn from God (2 Tim. 3:1-4). 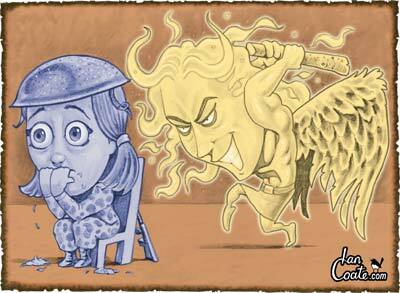 We are in the middle of a spiritual war raging between God and Satan (1 Pet. 5:8-9, Rev. 12:9-10). It breaks all the rules of warfare. You see, the war has already been won and all that is left are the battles. Christ won the war at the cross and his victory was complete, but still the battles continue. As Christian soldiers, our personal battles are to bring further glory to God and His victorious Son. Whether we win or lose our personal battles, or how many times the Devil seems victorious, we can rest assured - the war has been won and victory is ours. How comforting is the knowledge that the outcome of this war (on which our very souls depend) did not and does not depend on us. God controls history. No matter how dark things in time may seem, how big the adversaries or how we personally fail; if we have accepted Christ as our Saviour, victory is assured in eternity. 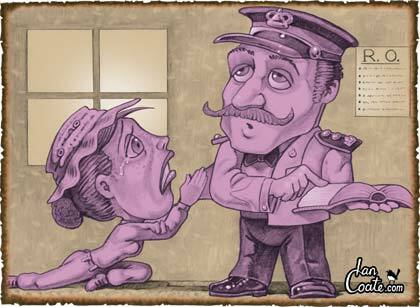 A happy soldier was sent to military prison for insubordination. First, as is the procedure, all his luxuries and privileges were taken away. Then, to deter him from offending again, his days and nights were filled with meaningless tasks overseen by stern guards. Normally, as a consequence of these actions all imprisoned soldiers would walk around in perpetual gloom. However, this happy soldier never stopped smiling – despite what grubby task he was given. He was always pleasant no matter what trial was put before him. As Christians, we should go through life like the Happy Prisoner. We are all incarcerated in the Devil’s kingdom, but when we believed in Christ, we won ‘ lotto’ and no matter what unpleasantness we encounter thereafter, we can happily reflect on the fact that God is waiting outside ‘life’ with our new car (resurrection body). Then we will spend eternity basking in the riches of Heaven. In the main, resistance fighters are average citizens fighting for freedom in a territory overrun by the enemy - often at great risk to themselves and their families. Resistance takes many forms – gathering intelligence, producing underground newspapers, sabotaging enemy plans, assisting escaped POWs and allied troops. Resistance fighters depend heavily on outside help to obtain valuable information and supply needs crucial to continuing their opposition. 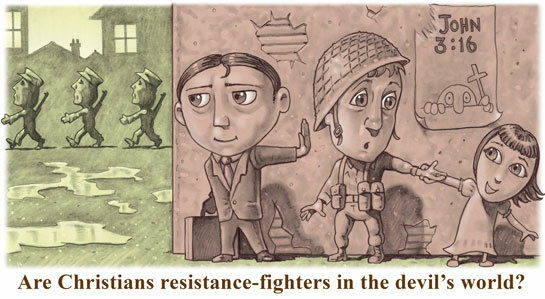 God has called all Christians to be resistance fighters in a territory (the Devil’s kingdom) overrun by the enemy. We are citizens of humanity, fighting for the spiritual freedom of our fellow man. Outside help is crucial to our resistance. We rely on God to supply our needs. He has provided our essential information (the Bible), and equipped us with weapons (not physical - but spiritual). As Christians, we can do many things to aid the resistance: (1) Gather intelligence (learn Biblical truths). (2) Spread that information (the Gospel) any way possible. (3) Arrange Christian meetings in safe locations (church). (4) Sabotage the enemy’s (Satan’s) plans - through prayer. (5) Refuse to participate in actions (sin) that aid and advance the enemy’s cause. (6) Aid fellow resistance fighters (teachers of God’s Word) in any way possible. As with all resistance, the risk can be great, but there will come a day when the occupying enemy is cast out and all sacrifices (great and small) will be remembered and rewarded. It may be a sign that we are a sloppy Christian soldier if we are continuously asking God questions already answered in the Bible. 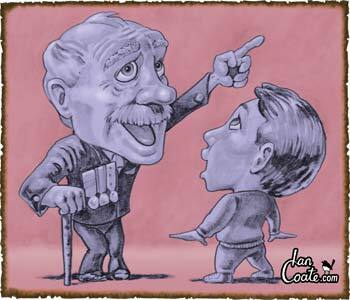 Furthermore, if our prayers are in opposition to what God has clearly stated in the Bible, they will not be answered. God will never compromise His written Word, no matter how long or often we pray He may make concessions for our particular circumstance. As good Christian soldiers we should become familiar with our Biblical orders. If we know and follow our Divine instructions we will avoid much of life’s pitfalls and be thoroughly equipped to complete our individual duty. Very few people like tests; however, they are good indicators of our readiness for certain undertakings. Tests are usually given in controlled environments so, should we fail, the damage will be minimal. For example, in the military, if we cannot pass basic weapon handling it demonstrates to ourselves and others that we are not yet ready for combat. Why does God test us? He already knows our capabilities. We undergo testing to gain confidence and to demonstrate to ourselves and others that we can handle certain situations. 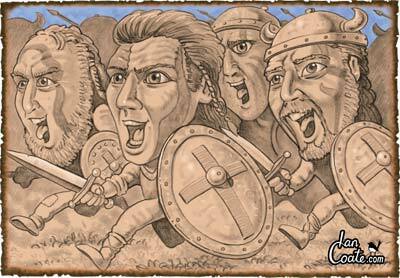 David fought off numerous predatory animals before he faced Goliath. If we were to venture untested into certain ministries, we may be accidents just waiting to happen – a danger to ourselves and those around us. We could shoot our mouths off at the wrong time or do things without thinking and cause immeasurable damage. If we remain faithful to God’s plan one thing is certain – we will eventually face testing. He will engineer many controlled circumstances so as to practice our spiritual skills. But not to worry - God doesn’t test us beyond what we can handle. If we happen to fail, God in grace will allow us to try again. When we finally pass one of life’s tests, new prospects will eventually present themselves. Keep in mind, even our Lord was tested in the desert before he started His ministry. A dictator is rarely seen to personally attack enemy soldiers on the front line. In World War II, Hitler didn’t personally fight soldiers in the opposing armies; he was far too busy planning, administering and leading. However, he did orchestrate bombing raids, send in troops to set up minefields and order his armies to fight his battles. We may claim we are being personally attacked by the Devil, but this is highly unlikely. Almost certainly, Satan is completely oblivious to our individual existence; he is far too busy planning, administering and leading. Things aren’t going very well for Satan since Christ’s victory on the Cross. Satan must spend most of his time scheming to outmanoeuvre God, while quelling rebellion in his own ranks and trying to keep up morale in his now-evident lost cause. Unlike God, Satan is not all-knowing or all-powerful and he cannot be everywhere at once. To deal with pesky Christians, Satan and his fallen troops have ingeniously set up many obstacles to entrap us (systems of pride, lust, hatred, to name a few). Only when we pass through these obstacles, will we receive personal attention from one of Satan’s fallen angels. If we keep advancing, our name may reach the Devil’s ears when, like the Apostle Paul, we receive many medals for spiritual bravery. Pending that time, we are just clumsy Christian soldiers, getting tripped up in our pride and blown up with our lustful desires. Satan has nothing to worry about and certainly doesn’t have time to personally attack us. It is an occupational hazard for military recruiters and war veterans to embellish ‘the highs’ of military life and neglect to mention ‘the lows’. The problem of omitting these details is that it unintentionally gives a false impression of military life. 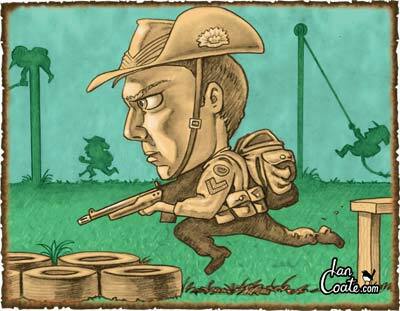 Soldiering is mostly repetitive training, living in unpleasant circumstances with long periods of boredom interrupted by short moments of action – which are over all too quickly. Sadly, many new recruits leave the military, disappointed with the lifestyle that failed to live up to the thrilling expectations. Evangelists, missionaries and Christian veterans telling spiritual war stories can unintentionally give the impression that the Christian life is one emotional high after another. When it is not, we think there is something wrong – either with ourselves or with Christianity. The problem with inspiring testimonials is they focus on victories and leave out the in-between-times: the years of repetitive training, the seemingly unanswered prayers, the frustration, boredom, emotional lows, setbacks, private failures and doubts. These uninspiring details do not make for good story-telling, but are the realities of Christian soldiering. Our spiritual lives will be filled with many ‘highs’ and ‘lows’, but to get to those inspiring mountaintops, which everyone likes talking about, we must all march through many mundane valleys. A War Memorial is a monumental structure which commemorates the sacrifice of men and women in times of war. Nations build these structures so citizens will remember the names of gallant heroes who have faithfully, bravely and at great personal cost served their country. As Christian soldiers, we are presently serving in a spiritual warfare that has been raging for thousands of years. In the eternal future, when the war is over and we are all safe in Heaven, no doubt there will be a Spiritual-War-Memorial built by God to commemorate those who served faithfully, bravely and at great personal cost. The most prominent feature will be of Christ’s ultimate sacrifice. The names of Apostles and other biblical heroes will also be well memorialised. Martyrs will probably have their own ‘Hall of Valour’. Pastors, teachers and missionaries will not be forgotten. Christians who faithfully served but never received recognition on earth will be duly recognised. Medals and crowns will be on display with the stories of the recipients carved in stone to stand as an everlasting testament to the Glory of God, Christ and Christian patriotism. 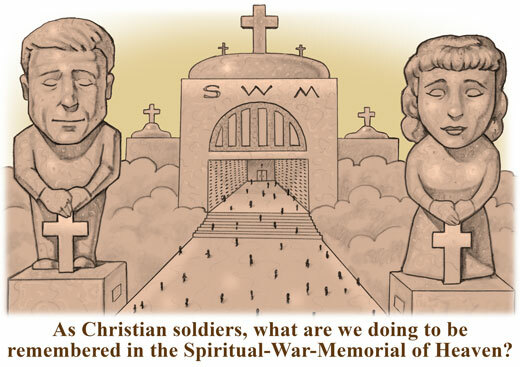 We should take time to ask ourselves: ‘How will I be remembered at the Spiritual-War-Memorial? Does my life bring glory to God?’ One thing is for certain - if we have neglected to don the Armour-of-God and serve our Heavenly Nation, our name will not appear among the honoured. Nations award medals and military decorations to soldiers in recognition of sacrifices performed on behalf of their fellow countrymen. These awards are for those who have shown great courage or served selflessly beyond the call of duty. Interestingly, there are soldiers whose focus is to win medals. Their motivation is personal glory – not their nation’s best interest. These soldiers, no matter how good they are at their job, will often place personal ambition above the welfare of fellow soldiers. ‘Love of country’ is simply a term they use to justify their primary motivation – glory seeking and self-aggrandisement. God has promised rewards and decorations for Christian soldiers who serve faithfully and selflessly. Rewards are there to encourage us to stay the course and to reassure us that our Heavenly Father honours those who honour Him. Eternal rewards are a legitimate motivation, but should not be our primary motivation. We should serve out of love for God, to save the souls of fellow humans and for the glory of our Lord in Heaven. We must do a right thing in a right way. God always looks at our heart – He knows the motivation behind our deeds. A question we should ask: If we serve only for future rewards and recognition, do we really have God’s best interests at heart or are we simply glory-seeking? Excellent for classrooms, bedrooms or bathrooms. PRESS HERE TO SEE MORE.